I have never seen anything divide geeks as much as Marvel vs. DC has. Not only do people have their favorite heroes and villains, but favorite sides completely based on the brand. But in a battle between Marvel favorites and DC equivalents, who would win? Here is the moment where I have to reveal that I am on Team Marvel, because Iron Man is one of my favorites. 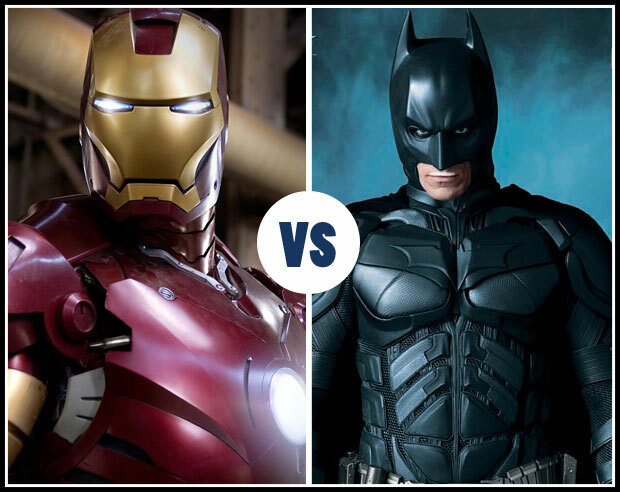 But I will try to remain unbiased, although I am convinced that Iron Man would win. They are both billionaires who have power in their tools rather than in their bodies. They differ because Batman relies on having money and his desired vengeance/ guilt for the loss of his parents. Iron Man in a genius billionaire, who clearly crafts his own suit and energy source, and fights because of the pain he has through the weapons of Stark Industries. Motivations aside, Batman’s idea of justice is rather flawed, seeing as his best plan is to capture, beat, and ignore his villains until they start to cause havoc again. Iron Man isn’t afraid t spare a life for the sake of millions.Finally, Iron Man fights for his life, and makes huge life changes because of being Iron Man. If I were a betting woman, I’d bet on Iron Man. Based on comics, both of these ladies hold their own. 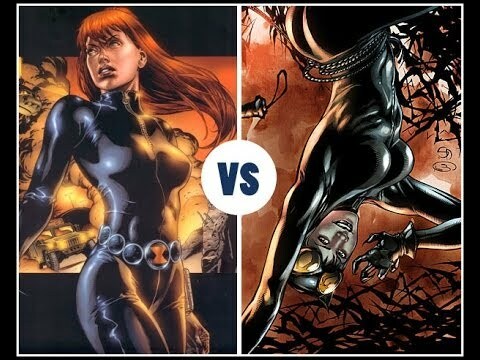 However, Catwoman has no super powers, while Blackwidow has been injected with the Super Soldier Serum (the same as Captain America) so her body is in peak physical condition. Blackwidow has trained military skills, so she has weapon specialties and a skilled marksmen, along with martial arts abilities. However, Catwoman has gymnastic and hand to hand combat skills while also having an equipped suit with retractable claws and the ability to scale many surfaces. If these two started fighting, it would be very close, and probably could go either way. But, in my opinion, Blackwidow is more of a weapon, although Catwoman is a tricky target. Both known as Master Archer’s in their respective universe, Hawkeye and Green Arrow are the bow and arrow equivalents of each other. However, when looking beyond the archery, how do they compare? First off, Hawkeye is a strategist, meaning he can plan and adapt his attacks quickly. Hawkeye is also more comfortable performing lethal actions, while Green Arrow is not initial lethal (although this does not mean his is incapable of lethal attacks). Green Arrow, however, is more creative and instinctual with his attacks, because of his time having to survive while stranded on an island. When it comes to close combat, Hawkeye has shown more skill in this area, although both are trained in various martial arts. All in all, Hawkeye has more strategy and trained skilled in all areas, and is less hesitant at attacking than Green Arrow. Super human body vs. super human mind. Deadpool has regenerative health equal to that of Wolverine, so he can heal wounds in seconds, including large wounds like punctured organs. Deadpool is also at peak human strength, and possesses superhuman agility, reflexes, and stamina. He also has hand-to-hand combat skills and is a master assassin, so killing is his main job. Deadpool is also very known for being wildly unpredictable while fighting. Deathstroke has incredibly enhanced mental abilities, using almost 100% of his brain. This makes him a master strategist and tactician and he can predict an opponent’s actions ahead of time. He also has superhuman strength, agility, reflexes, and stamina. Deathstroke is trained in various martial arts, and is also skilled at long distance combat, with weapons and explosives for all ranges. However, Deathstroke’s cannot not heal and regenerate as quickly as Deadpool, but his armor and helmet can protect him from the majority of damage. 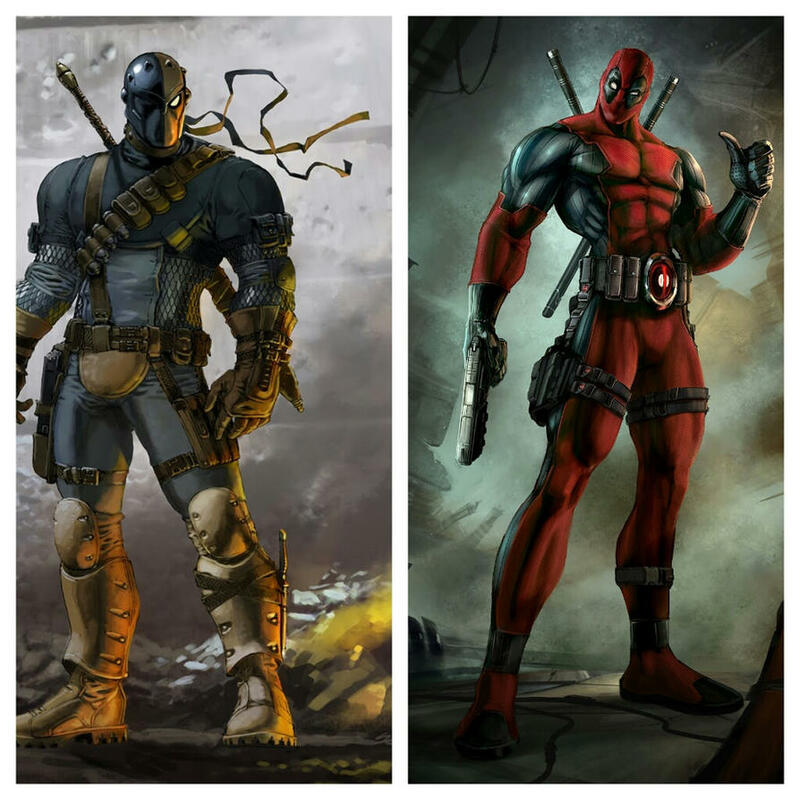 This might be the toughest fight, but because of Deadpool’s insane healing abilities, I think he has a better shot at winning, but Deathstroke would put up a great fight. Ah, the fight of the god-like heroes. Both have incredible powers that they were born with. Superman is known for his strength, flight, and speed, while Thor is known for strength and magic. 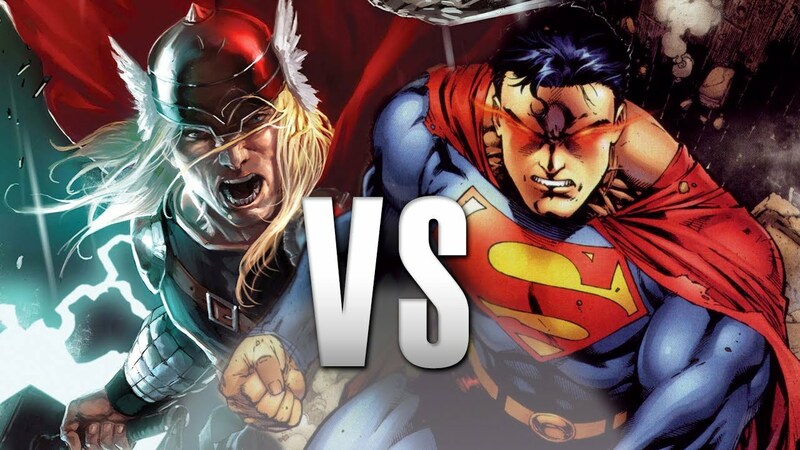 Both have equal strength, but Superman’s speed can throw off Thor, and flying makes the battle more difficult. However, Superman has known weaknesses, while Thor does not. Thor has his magic, especially Mjolnir (his hammer), which can create Earth shattering damage. And only Thor can utilize Mjolnir, so Superman can’t use that against him. Thor also has significant more experience fighting and using his skills than Superman. Also, as with every other DC character, Superman does not murder his attackers, so that does not aid him at all. Overall, I think Thor has a better chance of winning, because of his honed magic skills and incredible strength and lack of known weaknesses. Do you agree or disagree with my conclusions? Obviously these are my opinions, not 100% factual. Also, if I removed the DC no kill factor, it would probably change the results in a couple of duels, but that characteristic could not be removed in my opinion because it is a key part of the character. I have never read such an awesome break down! I didn`t grow up reading comics or geeking at all except for Star-trek because that’s what my older brother liked. After meeting a gaming man and falling in love, he has introduced me to to whole Geekdom. Wonderful friends over the years have introduced me to more fandoms and oh so much more joy but it is incredibly hard to hear a relatively unbiased break down of so many of the characters! It is great to hear about the backgrounds and personality’s of these people, I definitely need to read some of their comics because I think I`m going to love some of these characters! I’m Team Marvel. Their TV shows and movies are better. My biggest problem with DC is Batman, which is one of the most iconic superheroes. Batman is not super. He has no power. All his abilities and cool things were from Alfred (the real hero LOL) and Lucius Fox. Where as Tony Stark’s gadgets and suit were made by him. He is honestly a genius, as well as rich. I loved this article. It totally feeds my inner geekiness. In college, I accidentally took a comics class–it was called Heroes, Superheroes, and Anti-Heroes (I thought it was literary). Ever since then I’ve been in love with all comic book lore. Admittedly, I haven’t read much in the last years, but I still love reading about it. I was trying to decide which one I preferred most, but I keep going back and forth! That was so fun to read! I have to admit I am also Team Marvel. I’m not necessarily a comic person but I love the movies and rediscovering them through the eyes of my kids. My hubby and I are both geeks and I love the Justice League (and Unlimited) cartoons, and we both LOVE and own all the Marvel movies. We had fun reading this! Great read! I’m definitely more of a Team Marvel girl myself. I’ve not read the comics, but based on movies and shows, I lean towards Marvel. Fun post!! I, too, am team Marvel.